Following Facebook’s lead, Twitter will begin labeling in-stream ads from political candidates and those which “advocate for legislative issues of national importance”, in order to provide more transparency over politically-motivated advertising, and reduce issue manipulation. As you can see here, ads that fall into these categories will now have a specific (issue) label attached. 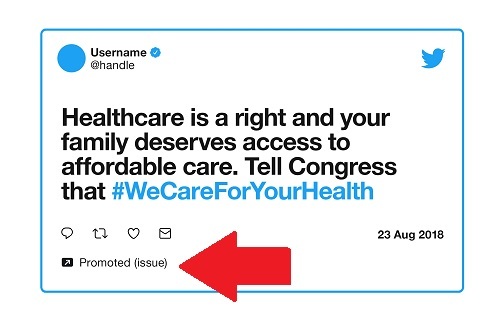 Those under the first category – provided by political candidates – will have an additional ‘Paid for by’ label beneath the tweet. 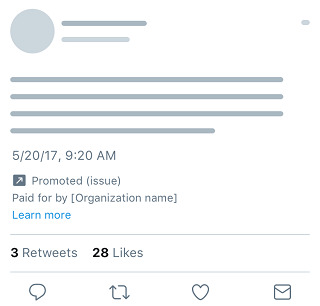 Additional information will also be added into Twitter’s recently launched Ad Transparency Center, enabling users to get more context on each. As with Facebook, Twitter has taken the broader step of including ‘issues-based’ ads in their definition here, because focussing on ads from candidates themselves would be too narrow. The vast majority of the adsfound in the recent investigations into manipulation by politically motivated groups ahead of the 2016 US Presidential Election were not linked to the candidates themselves, so the expanded definition of ‘issues’ ads will give Twitter, and Facebook, more scope to weed out such misuse. Facebook’s policies include news publishers, which has caused some tension. They have sought to soften this stance, but they’re still working on an optimal solution. In this context, Twitter’s approach makes sense, though it’ll be interesting to see which publishers meet the platform’s criteria for exemption, and which don’t – and whether that sparks a new row over platform censorship. Enforcement of Twitter’s new policies will begin on September 30th, initially in the US only. Twitter says that it will look to expand its political content policies globally as part of its ongoing effort to improve transparency, and ensure its platform is not misused for such purpose. You can read more about Twitter’s new political ad policies, and exemptions, here.